Distinction by Rahab Jordan: Have Demonic Spirits Infiltrated Your Home? 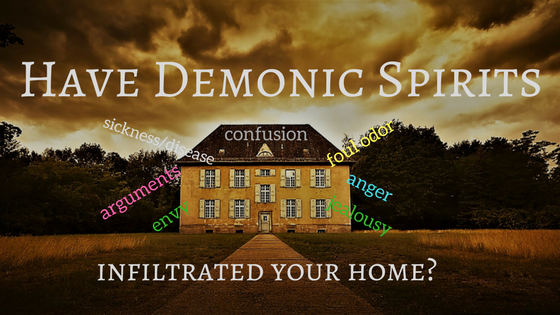 Have Demonic Spirits Infiltrated Your Home? Image: Getty Images - Lettering: "Hard to Swallow"
Before you answer the question: Have demonic spirits infiltrated your home, let's establish whether demons are real. You say, "I don't believe in that sort of stuff." Whether you believe it or not is irrelevant. Demonic spirits are real and they're not affected by whether you acknowledge them. In fact, your unbelief only makes you more susceptible to their harassment. This does not mean that you should preoccupy yourself with thoughts about demonic influence. No. Just be aware of the many ways demonic spirits can infiltrate your home and guard against them. All demonic spirits need is an entry point into your home. OUIJI BOARDS and TAROT CARDS are a definite no-no. If they're in your house, GET RID OF THEM! -and pray to the Highest, Almighty YAH to rid your house of whatever it unleashed. Let's say you're already a diligent servant of righteousness to the best of your knowledge and ability. And let's assume you pray and anoint your house, windows, and doorposts (basic entryways). You're watchful. You do all the right things you know to do. As a result, your home is peaceful and the presence of the merciful King is felt throughout. Then one day you realize that your family members are angry and arguing all the time. There are strife and cruelty between siblings, spouses, and even the dog has an attitude. You don't even know when the atmosphere in your home changed. You just know it did. And you're confused because now you're wondering "how can everybody in the house be angry?" -including the dog. Demonic influence infiltrated your house. How these principalities get into your home is mindblowing. There are so many ways Satan uses to gain his imps access to your space. For example, anyone who is already plagued with demonic activity can bring them to your house with them unaware. *They will come in ONLY IF your house is not consecrated to YAH, the Almighty. I find it beneficial to also pray each time someone knocks on the door. -and after they leave. You say, "That's too much praying for me. It shouldn't take all that." I agree. It shouldn't take all that. But it does. It takes all that and more to 'endure to the end'. We're talking about a fierce enemy that's more powerful than human capacity. -but unable to harm us unless we choose to live in ignorance, unbelief, and rebellion against YAH. You have to remember: Satan is the ruling authority on this earth (until his time is up). Demons attach their essence to anything that demon-possessed individuals pray over, own or wear. For instance, Satanists (called witches and warlocks) pray over the books they write and ask Satan to enter into the reader. Did you know that? Their clothing holds demonic spirits. Everything they own or touch carries the darkness of the underworld. They may have even tried on the clothes you purchase from a department store. This is Satan's domain. He and his imps are everywhere seeking to deceive and destroy everyone. *remedy: pray over everything you purchase and ask YAH to drive out all darkness and consume it with His marvelous light, peace, power and protection. If you purchase something from a thrift shop, you run the risk of bringing demonic spirits into your home. Rummage sales, antique shops, and any place that sells second-hand goods are homes for demonic spirits to dwell. An unsuspecting buyer transports darkness back to his or her home. And unless they are already walking close to YAH, they won't be able to discern the dark presence. If they don't get rid of it, the spirit will remain and multiply and wreak havoc. -inviting others that come and go at liberty through the portal (entry point) that's been created. As you may have guessed by now, this subject is broad and far-reaching. Too broad to include it all in one post. Perhaps I'll do a part II a little later. We'll see. For now, I mainly wanted to enlighten you on the unseen world of darkness and evil around us. We can't forget that this is Satan's domain for a time. Nor can we afford to live in a fragile world of rebellion, fear and unbelief. This is real, people. Nothing superstitious or spooky about it. You don't fear the devil, you RESIST him. But you can't resist what you don't know is present. If you have a question on this subject or if you want recommendations on how to rid your house of suspected demonic activity, send me a private message. I'll get back to you as soon as I can. Understand How Demons Operate in Your Life - gives in-depth insight into demonic activity using biblical reference. Highly recommend. Signs of Demonology - lists several ways to recognize possible demonic activity in your home. Not as thorough, but good to know. May YAH keep you and your family safe in His care and protected from all darkness.